Sardonyx is a brown and white banded variety of onyx primarily used in glyptography. 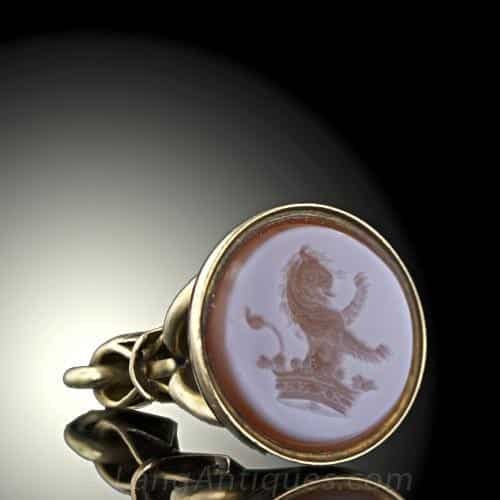 Antique Victorian Sardonyx Seal Fob. Gem Reference Guide, Los Angeles: Gemological Institute of America, 1988. Pp. 45-48. Newman, Harold. An Illustrated Dictionary of Jewelry, New York: Thames and Hudson, 1981. Pp. 269. Schumann, Walter. Gemstones of the World, New York: Sterling Publishing, Co., 1977. Pp. 142.